The chain of islands in the Pacific Ocean off the coast of Ecuador is famous for its inspiration of Charles Darwin’s theory of evolution and natural selection. Here on the Galapagos Islands, animals have evolved and adapted to survive in ways found nowhere else on earth. I recently had the incredible opportunity to go on a 7-day Galapagos wildlife cruise with Ecoventura, one of the most eco-friendly and sustainable tourism companies in the Ecuadorian archipelago. We set off from San Cristobal, on a path that crossed the equator six times and visited 7 islands during the week. Hiking, snorkeling and kayaking were all part of the activities to view the islands and their unique ecosystems and wildlife. One of the most unusual aspects of Galapagos wildlife is how unafraid they are, how completely unperturbed they are by people. Because they are protected and mostly have no natural predators, they really fear little and see no threat from humans in modern times. They do not flee — there is no searching and waiting to spot wildlife. It is right there in front of you, and you can walk right up to them. Our Ecoventura guides, both named Pepe, were clear about the rules not to touch or interact with the animals. But you literally can walk right up to them — iguanas, birds in their nests with babies, sea lions who will swim right up to the boat and want to play. This can also be their downfall, if not properly protected. "The Islands retain a staggering 95% of their endemic species, a feat unparalleled on any other archipelago in the world," says Santiago Dunn, owner of Ecoventura. 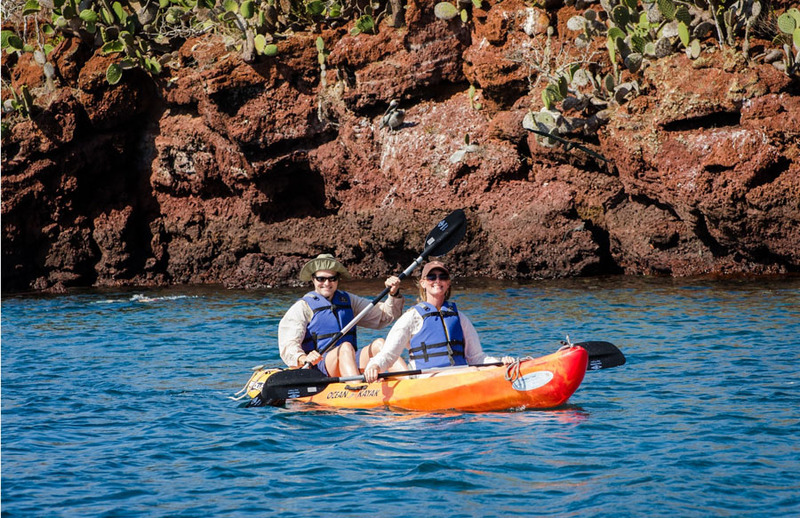 "Keeping Galapagos biologically pristine has been and continues to be, a constant and hard-waged battle. Tourism to this remote volcanic archipelago is both part of the solution and also part of the problem." One thing I really liked about the Ecoventura line, besides the wonderful guides and staff, was their dedication to making the least footprint possible on this ecosystem. The boat we were on, The Eric, had solar panels and wind turbines to supplement the power. Ecoventura was was the first company to earn and maintain the ecological certification, SmartVoyager, and the first Galapagos cruise ship company to offset carbon emissions and to install alternative energy sources. This is so important in the Galapagos Islands. Darwin’s enchanted isles are one of our planets most precious and unique ecosystems, home to an extraordinary profusion of exotic flora and fauna. In 1959, a hundred years after the publication of The Origin of Species, Ecuador declared 97% of the Islands landmass a national park and in 2001, the marine reserve was established. In 2007, three decades after being designated the first World Heritage Site, UNESCO declared Galapagos as a World Heritage Site at risk, citing introduction of alien species, illegal fishing, unsustainable tourism, illegal migration and population growth. Galapagos was later removed from the list in 2010, but many conservationists feel this was done prematurely as the Islands still remain very much at risk. Arrivals to the Galapagos have tripled in the past 15 years due to the growth in land-based tourism operations. During this time the type of tourism available to visitors has changed with land based accommodation and activities now representing 50% of the market, according to the Galapagos Conservation Trust. Pressure to build resort style hotels and bring larger cruise ships to Galapagos is a constant reality. "The growing number of settlers migrating from the mainland of Ecuador to the islands, largely in response to the recent boom in tourism, has also put pressure on a fragile environment that imperils the entire ecosystem," Dunn adds. Visiting the islands by water, as a tourist, has by far a lower impact than land tourism. The number of highly regulated, self-contained non-diving live-aboard tour boats has not changed since 1998 after the introduction of the Special Law for Galapagos. Ecoventura is committed to providing an authentic experience in small compatible groups, lessening the impact on the wildlife, offering value, and a safe, memorable, mind-expanding voyage. The company began offering tours in the Galapagos in 1991 and started “greening” the operation and equipment in 1999, and later worked toward reducing carbon emissions and ensuring the local community benefits by tourism through educational opportunities and supporting marine conservation. So, what should a potential visitor to the Galapagos know, in terms of how to select a reputable tour operator and how to visit the Galapagos in a way that won’t harm it? Liveaboards are self-contained and have less impact on the local limited resources. Convenience, all the planning and logistics are done, the itinerary is set, all meals are provided, and there is continuity, and you only have to pack and unpack once. Navigating at night means fewer daylight hours are lost while spent in transit and passengers have more time on the islands. Tour boats, also called liveaboards, visit the islands and wildlife in the early morning and late afternoon, when wildlife is more active and the sun less intense. Do not take any food or drink other than water to the uninhabited islands. Do not touch or feed the animals. A distance of six feet between you and an animal is required. Also, do not allow them to touch you. Ask your tour operator if they have a responsible tourism policy. Only travel with operators that can demonstrate that they are doing as much as they can to support conservation efforts and ensure that local people benefit as a result of tourism. Consider your environmental impact when traveling. Fully cooperate with environmental inspection and quarantine services personnel during your visit. Introduced plants, animals, and certain foods not native to the islands are a serious threat to the delicate ecosystems here. Travel with a local tour operator. Ensuring that tourism is of maximum benefit to local people is key to the sustainable development of the islands. Following these guidelines and committing to be a responsible tourist will help to ensure that Galapagos tourism is sustainable in the future.